When you're striving for great things financially, it gets easy to get caught up in the race towards the next big thing. If you're a planner, a dreamer, or both, reaching the next big thing may not be enough. Because once you get there, you'll find a sense of disillusionment. You'll notice something out of the corner of your eye. It's a peak in the distance, and you'll set your heart on making it the next goal to summit. If you continue along this path, it's easy to lose your life to the pursuit of riches at the cost of other things in your life. It's easy to always be striving, and never really enjoy the satisfaction that should come in accomplishing major goals. It's easy to never be satisfied, to never be content. And that's no way to live life. ...all of your basic needs are met, and you are making contributions to investments that will one day be able to cover your retirement. ...you have healthy relationships with your family and within your community while the above conditions are met. 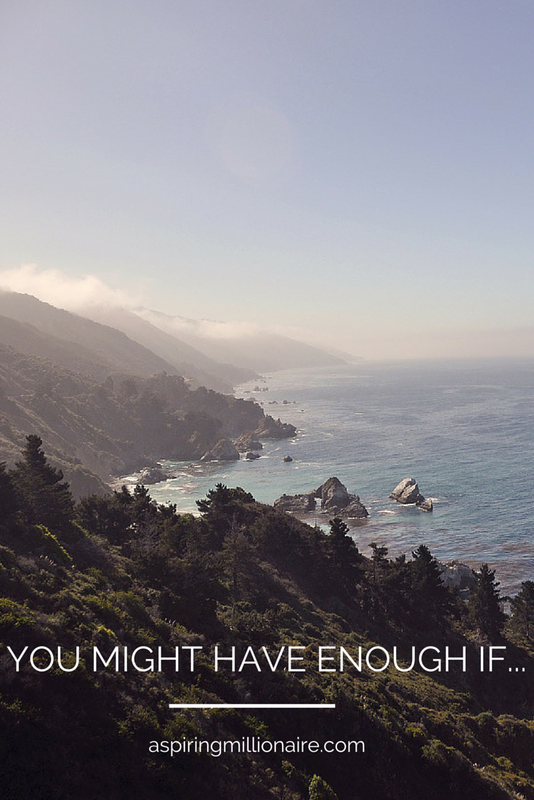 Oftentimes in striving to have "enough" we fail to realize when we have "too much." I'm not going to say we have too much money, because resources are hardly ever a bad thing when used properly. But if we're working too hard to obtain those resources, we might have too much. Too much work. Too much stress. Too many extraneous goals that don't really need to be reached in order to have a happy, fulfilling lifestyle. ...the idea of taking on more work makes your head spin because you're already hustling with no time to take a breather. ...your familial relationships are suffering even while you're working overtime to provide your family with an "even better" lifestyle. ...in your quest to get to tomorrow's goals at a quicker pace, you're missing all of the beautiful things that could be happening in your life right now. ...you don't have time to contribute to causes you support, but figure that your monetary donation will suffice. While they may be equal in the eyes of the organization you're donating to, giving of your time allows you to have a richer experience and face-to-face interaction with people that support the same causes you do. Never underestimate the importance of human interaction in determining the gravity of our experiences here in life. ...your idea of happiness is definitively tied to a number attached to a dollar sign with no room for error or flexibility. Do you feel like you have enough? Or too much? What things make you feel sated, and what feels extraneous?